A white and grey color combination is so chic! 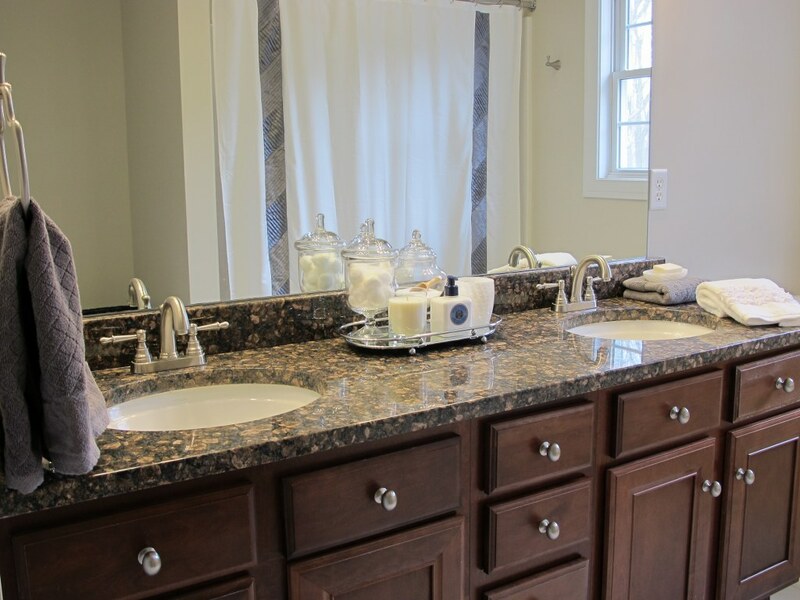 I like using that color combo in my wardrobe and throughout my home, like in my guest bathroom. 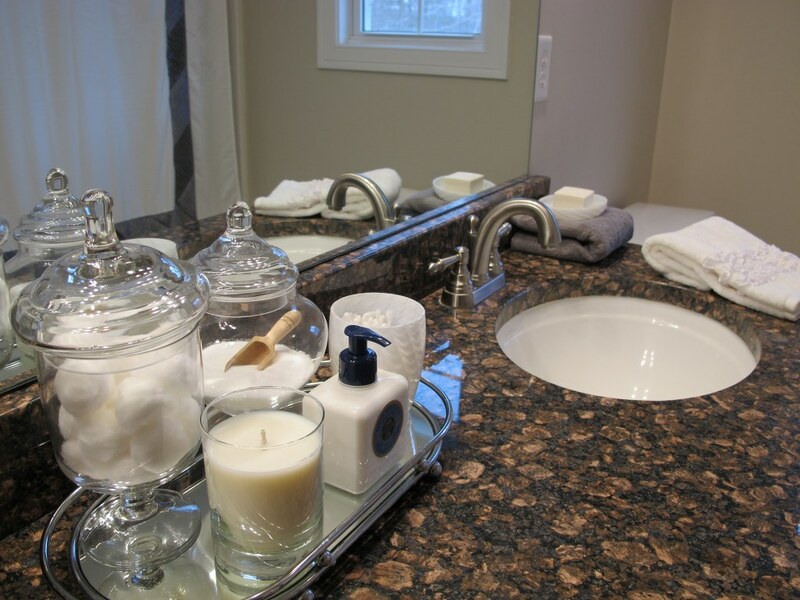 Since this bathroom will primarily be used by guests, I want the decor to be simple and functional. 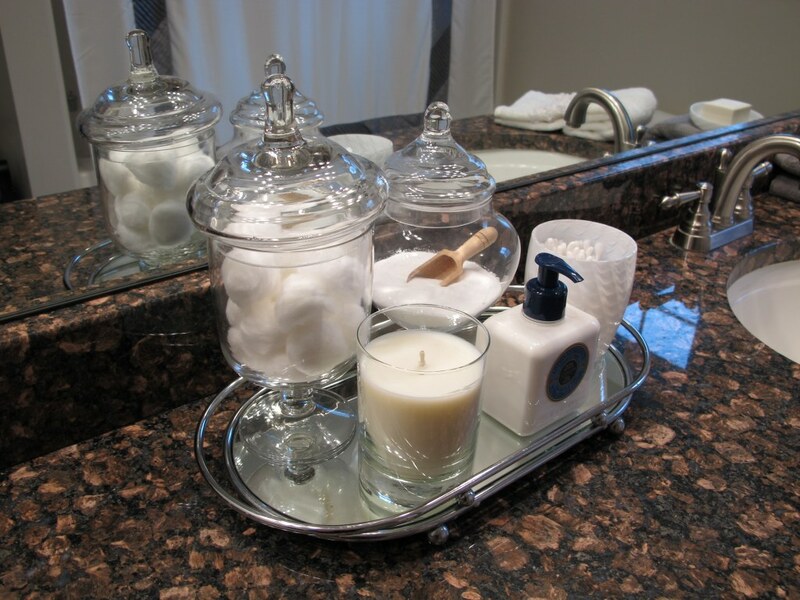 I tend to avoid matching bathroom sets because I like mixing different accessories to give a more natural look. After I wash up in a bathroom I don’t like dragging my wet hands around looking for a towel. 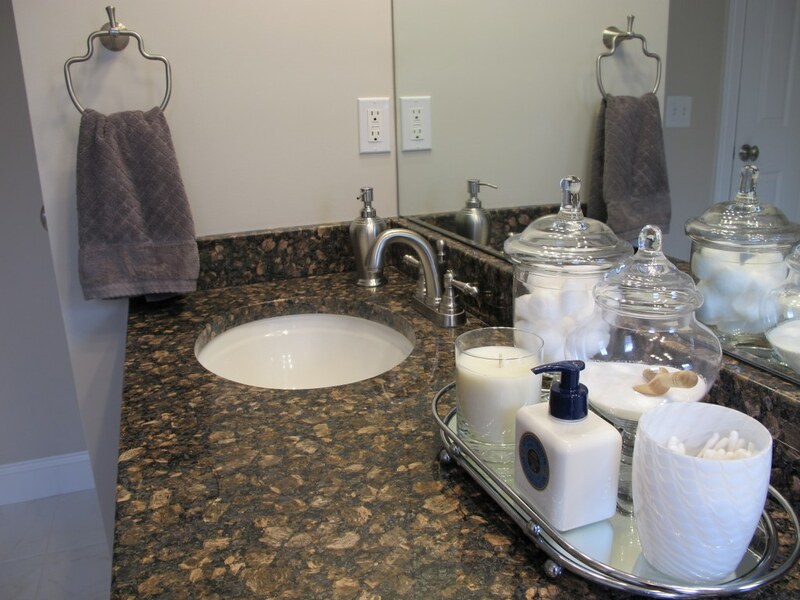 Maybe that’s me being neurotic but I’ve placed hand soaps and towels at each sink so that my guests can avoid playing a guessing game. I used three different towels to introduce a variety of textures because it looks more interesting. Also there aren’t a lot of opportunities to introduce color into a bathroom setting and towels are the perfect way to do so, as I’ve done. I have cotton balls, cotton swabs, bath salts, and hand cream all out for easy access and they are all appropriately white to match my theme. The cotton swabs are actually in a milky white glass drinking cup! It’s fun using things for a something other than what it’s designed for. Of course I have to incorporate a candle into the vignette! I’m crazy for candles and I especially love these soy candles from Scentsational. I must have at least one Scentsational candle in every room in the house. I want my guests to feel welcomed and hopefully that’s how they’ll feel! Inspiration: Style At Home and Better Homes and Gardens. Note: Not a paid advertisement for Scentsational. I’m just sharing my opinion. I love how this looks! I’m trying to set up a similar vignette in my bathroom and I just got a jar to put bath salts in but I can’t find a little wooden scooper like you have in yours. Do you mind sharing where you found it? Thanks so much! Thank you! You’re right, there are a ton of them on Amazon. I don’t know why I didn’t think of that, lol. Thanks again!